May 2-5, 2016 The 16th Annual US Indoor Facility Operators Conference was held in Henderson, NV. Seaman Corporation sponsored an executive breakfast session for owners and operators of sports facilities from all over the United States. The three day meeting featured presentations from members, seminars on local building regulations, operations techniques, and two days of convention floor trade show where members and sponsor could exhibit wares for the indoor sports facility industry. 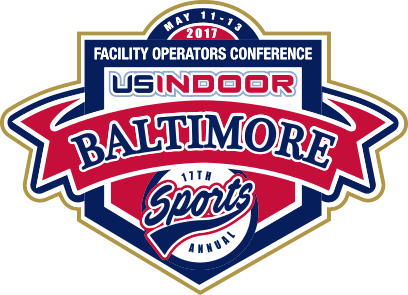 The US Indoor Conference and Trade Show is widely regarded as the premier educational and networking event for the indoor recreational sports industry. Seaman Corporation, along with Joe DiCesare, Global Architectural Fabrics Market Manager, and Felon Wilson, Director of Industrial Fabrics, exhibited Shelter Rite Architectural Fabrics at the 3 day trade show. There, owners and builders were shown the latest PVC coated polyester architectural membranes featuring top finishes ranging from acrylic and PVDF to all of the Dupont Tedlar family of colored PVF films, and Seaman’s latest printed color Kynar fabrics for building applications. It's all about strength to weight ratio! Industry statistics for 2017 show 5.0-6.5% growth in Sporting and Leisure activity buildings (as noted in the AIA Consensus Construction Forecast Panel), where new building owners can stretch their investment in looking at architectural fabric membrane options. Seaman Corporation can lead owners & investors to selecting the best US made membrane materials for their new sports facilities.